There are specific locations within our energy systems for the sensations, emotions, thoughts, memories and other nonphysical experiences. 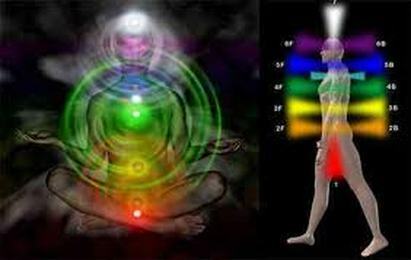 These comprise the Chakras and the Human Aura or Human Energy Field (HEF), which is the energetic body that surrounds and interpenetrates the physical body. The word Chakra is a Sanskrit word meaning wheel. In Eastern esoteric literature, each of the chakras is seen as having a certain number of petals. On closer investigation, these petals appear to be small rotating vortices spinning at very high rates. Each vortex metabolizes an energy vibration that resonates at its particular spin frequency. The colors observed in each chakra are related to the frequency of energy being metabolized at its particular rate. There are 7 major chakras and 21 minor chakras. I focus on the 7 major chakras that are aligned along the spinal cord or vertical power current. Each one corresponds to the major nerve plexuses of the physical body in that area of the body as well as an endocrine gland. The chakras absorb the universal energy (ki, chi, prana), break it up into component parts and then send it along energy rivers called nadis to the nervous system, the endocrine glands and then the blood to nourish the body. Thus, each of the 7 major chakras are associated with specific organs, systems, glands and colors. Energy can be seen or felt flowing into all of these chakras from the Universal Energy Field. We are like sponges in the energy sea around us. It is important to open the chakras and increase our energy flow, because the more energy we let flow, the healthier we are. Illness in the system is caused by an imbalance of energy or a blocking of the flow of energy. In other words, a lack of flow in the human energy system eventually leads to dis-ease. It also distorts our perceptions and dampens our feelings and thus interferes with a smooth experience of a full life. When your chakras are functionally healthily, you vitalize the energy body and thus the physical body as well as bringing about the development of different aspects of self-consciousness and thus promoting positive self-development.